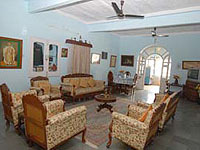 Rao Bikaji provides cosy environment to its guests. Owned by a scion of the Rao Bika (founder of Bikaner) family the hotel is an embodiment of Rajput culture and tradition. The owner, a retired Brigadier, enjoys enlightening the visitors on a variety of subjects ranging from the history, culture and religion of Rajasthan on request. His interests are homeopathy, yoga, spiritual healing and shooting. 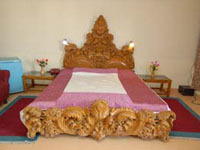 "Home away from home" is the motto of the Shri Ram Heritage. It is tastefully decorated are spacious rooms, with attached baths having hot and cold running water. It is located in a calm, quiet residential area within 1.5 Km city center. Open Courtyard in front and rear with big open terrace upstairs make the stay memorable and nostalgic. Col. Rajyawardhan Singh Rathore brought accolades to our family by winning silver medal in shooting athens Olympic 2004 representing India. He is very charming and fond of his lineage. He often comes and visit this heritage hotel. Achievement: Games; He also won gold in the individual and team events in Men's double trap at the 2005 Asian Clay Shooting championships at Bangkok; double trap team gold in 2005 Commonwealth Shooting Championships; Awareded Rajiv Gandhi Khel Ratna Award in 2004; Ati Vishisht Seva Medal. Hotel Shri Ram Heritage's Commitment to Natural Resources and conservation – Conceived out of deep commitment to ecology and healthy living, shri ram embodies our attitude towards life. We opened this eco-lodge to travelers in 1993, offering charming accommodation in an authentic surrounding. The crown of Thar Desert was founded by Rao Bika in 1488 AD. It has a blend of modernity and old culture, a royal culture emanating from chivalry, tradition and faith. Realising that a struggle for his paternal inheritance was unlikely to bear fruit, prince Bikaji, the son of Rao Jodha of Jodhpur, decided to chart out his own destiny. He assembled a strong force of young worriors which proved to be powerful in the hazardous desert. At Deshnoke he sought the blessings of Karni Mata, a mystic. She blessed him and prophesied victory and thus Bikaji defeated his opponents and founded the city of Bikaner in 1488. Desert city Bikaner stands on a slight eminence and has fascinating royal monuments, temples, havelies and colorful bazaars. 1. Camel Safari & Jeep Safari, Local Site Seeing. 2. 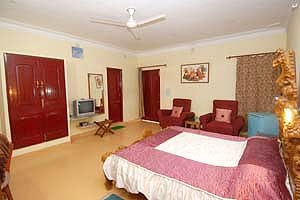 All rooms with attached bath with running hot & cold water in showers. 4. Telephone in each room. 6. Cable TV in all rooms. 11. Arrangement of Folk Dance. 12. Roof top parties arranged on request. 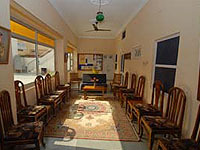 13. separate kitchen for groups and marriage functions. 19. Affordable selection due to variety in accommodation and special consideration for group series. In all cases, the water in the bucket remains clean and if any is left, it can be used for other purposes. By adopting the indian way of bathing, the guests help conserving water, scarce in Rajasthan. Rain fall in paved courtyard and from the roof is collected in an underground tank. This water is used for agriculture. solar pannels designed as per the Central Arid Research Institute – Jodphur. Solar oven: occasionally used for cooking rice and lentils. Low energy consumption bulbs using five times less electricity.